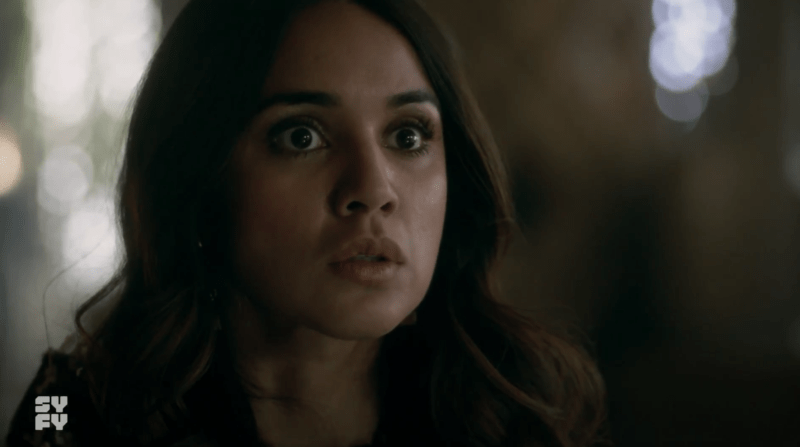 The Magicians constantly delivers surprise after surprise to the delight of fans and “The Serpent” is no exception. The episode opens with a masked hedge witch speaking into the camera. His voice is altered and he states that the Library has further reduced the flow of magic. He and another masked person drag a bound hedge witch on camera and infect him with a worm through his ear. When he tries to defend himself he is killed by the worm. The masked man warns that any and all hedge witches will be infected with a worm that will kill them should they try to cast or remove it. “Stop doing magic, it’s not for you,” he says. Kady and Pete are discussing the video when there is a knock at the door. Kady grabs a crow bar to defend them and opens the door to Alice who confronts her about attempting to take on the Library, “they are calling you the new Marina” she says. Alice offers her help and Kady, after punching her in the nose, accepts. Alice watches the video and informs them of her role in the Modesto explosion, but argues that they would need to open fifty or more magic pipes to have any real affect. She hatches a plan to drop tracers into the junction boxes and map the system. Pete and Kady agree, but come to the conclusion they will need a mole from inside the Library to locate one. At the Library, the Governing Council watches the serpent video and decides on a plan to protect hedge witches with Reid’s Mark, a symbol that will inhibit their ability to cast. They will offer the mark free of charge with zero paperwork or questions and also offer its removal once the vigilante group is dealt with. In her office, Zelda uses the mirror to find Harriet who is still trapped. Harriet tells her to find Alice. Meanwhile Alice, Kady, and Pete contemplate who could be a Library mole for them. Alice answers a call from her mother, but is distracted by a strange knocking. When she approaches the mirror she sees Harriet. Kady signs with her as Alice receives a photo message from her mother of yet another piece of Harriet appearing in her mirror. Kady tells the group that Harriet is saying she is in pieces. “I think we have our leverage,” Alice says. Alice and Kady meet with Zelda in a park to discuss Harriet’s situation. Alice tells her that they can piece Harriet back together, but that it will be very difficult. Kady demands the location of the nearest junction box in exchange for their help, explaining that without more magic the current situation is likely to lead to war. After some persuading, Zelda agrees. Pete asks for a word with Kady, he tells her that the Serpents infected a warehouse full of hedge witches and half are already dead. Kady wants to cast locator spells, but Pete feels that Reid’s Mark is a better option. Back at the house, Quentin, Julia, and Penny continue their search to decipher the message for Julia from the dragon. As they talk the Eliot Monster appears and tells the group that the stone they found was definitely a god piece, that only one piece remains, and demands the group locate Enyalius. Quentin, Julia, and Penny change course to research both how to track the remaining god and what ‘the binder’ could mean. The Eliot Monster threatens to hurt Eliot, threatening to go “ice cave climbing with no clothes,” if he feels they are taking too long. In Fillory, Margo and Fen discuss some peculiar singing snow issues but Margo shifts gears quickly to her destiny lizard’s message. Fen dodges the question (that’s not at all suspicious) in favor of approaching Josh who reveals the latest talking rabbit with the message, “Eliot. Alive.” Josh updates Fen and a shocked Margo on the Eliot Monster situation. He has planned a state dinner to bring everyone together to solve this latest crisis. Margo asks again if Quentin is sure Eliot is alive and kisses Josh fiercely when he confirms it. Fen exits the room when it becomes clear they are not stopping at kissing. Margo plans to leave and help save Eliot but Josh informs her that one of the invited tribal leaders, called The Foremost, has faced body possessing demons before and expelled them. Margo agrees this could be a way to save Eliot and leaves to prepare for the banquet. In his office at Brakebills, Dean Fogg informs Alice of the watch list for potential hedge witches requested by the Library. Fogg declares that he would rather resign than hand over that list, but Alice tells him he should stay and use this leverage over Zelda who needs his lab to save Harriet from the mirror world. At the Brakebills library Alice overhears Penny, Julia, and Quentin researching both ‘the binder’ and how to track Enyalius. Alice seems to waver on whether to approach them but ultimately leaves. The Eliot Monster is waiting for Quentin, Julia, and Penny back at the house. As he eats and watches tv an ad appears for a psychic promising information on past lives and repressed memories which seems to spark an idea. In the lab, Zelda hands Alice a mug of traveller’s blood while Kady draws a circle connecting the three mirrors on the floor. Alice draws symbols in blood on each mirror and tells Kady and Zelda to wait outside while she works, though Zelda is concerned about the stability of the device they are using. Alone, Alice summons the first fragment of Harriet out of the mirror. This Harriet pulls Alice out of the circle but she reenters it and fragments herself in two. The Alice’s struggle briefly and one knocks the other out and locks her away. Fen makes banquet preparations and meets Rue, the queen of West Loria. In private Rue tells Fen that her own prophecy stated clearly she must help Fen dethrone Margo. Fen expresses doubts about the prophecy, but Rue offers to sign a peace deal with Fillory once Fen is queen. Rue forms a plan to kill Margo at the dinner, and says she will kill Fen as well if she doesn’t cooperate. Quentin, Penny, and Julia return to the house with books and find that the Eliot Monster has taken a psychic prisoner. He explains he wants the man to help him uncover memories of his past life, but as they attempt to do so the man seizes and dies. The Eliot Monster is about to leave in search of another psychic when Penny offers himself instead. Julia attempts to talk him out of it considering he is likely to die trying, but Penny stands his ground and asks to buy her a drink if he survives. She ups the stakes with a dinner date if he lives and he accepts. Quentin and the Eliot Monster return from disposing of the psychic’s body. Seated across from one another, Penny enters the Eliot Monster’s mind and begins to guide him through a lost memory. They are in an empty field but an altar, four bowls with stones, and rope appear as he recovers the memory. He talks about the memory and how Bacchus, Iris, and Heca were afraid of him, but needed Enyalius to complete the ceremony. To summon Enyalius the trio of gods sacrificed an innocent girl. “He called me monster but look at him, he loved it. The scent of a dying girl,” explains the Eliot Monster. Penny looks around as he urges the Eliot Monster to continue with the memory and spots a door. Quietly, he sneaks away through the door where he finds the real Eliot. Just as Eliot finishes his urgent news the Eliot Monster realizes that Penny is gone and calls out for him. Penny runs out and explains his absence as an attempt to further explore the memory. They exit his mind and Penny begins to seize as he falls to the floor. The Eliot Monster announces that he knows how to find Enyalius and leaves to find a girl to sacrifice as Julia and Quentin care for the unconscious Penny. Zelda and Kady discuss Zelda’s past as they wait for Alice. Zelda reveals that she was a hedge witch, like Kady’s mother, and her mentor gave her shelter and education. She divulges that she trusts Kady to keep things fair and this is why she agreed to give them the junction box location. In the lab, Alice frantically thinks through her options as Harriet tries to sign to her. Alice, not understanding sign language, does understand Harriet insisting she needs the other Alice’s help. Alice confronts herself and they argue over what to do and the real reason the keys were destroyed. “You ruined my life,” she says. “We did that together,” the other Alice counters. She lets her out and as they walk away, a book appears with “Binder” written down the spine. 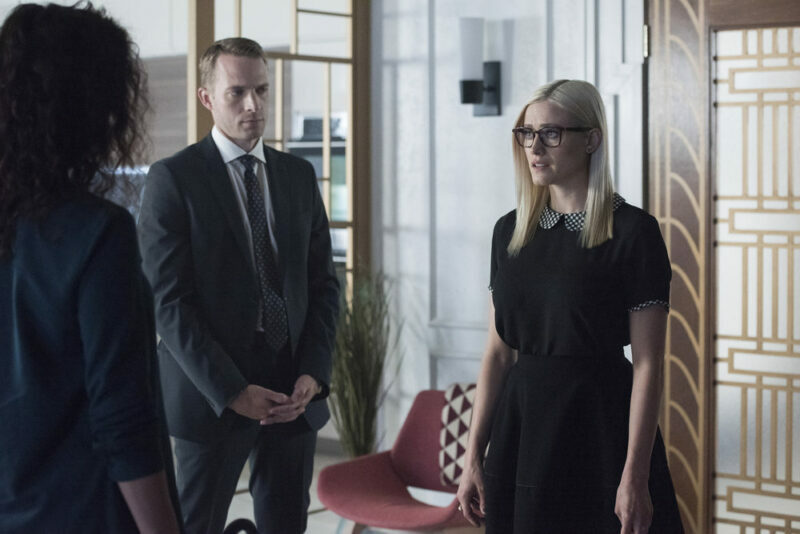 Remembering the overheard discussion, the other Alice grabs it as they return to the lab to work together. The banquet in Fillory is in full swing as Josh tells Margo he overheard Rue and Fen plotting to dethrone her. Margo asks Josh to hold off Fen until she can speak with The Foremost about his battle with the body possessing spirits. 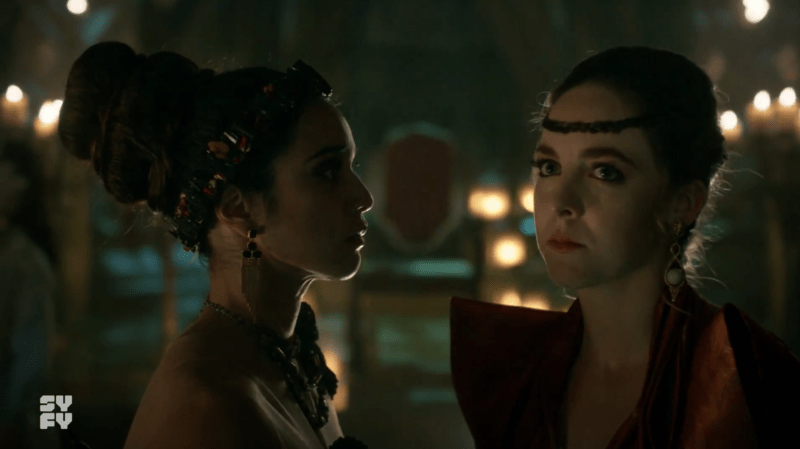 Margo informs Tick of Fen’s plan, but when she asks where The Foremost is he tells her his tribe are sworn enemies of Fillory and would never attend this banquet. Tick offers to go to their tribe, but Margo realizes she has to be the one to go. Fen leaves Josh to speak with Margo who tells her to overthrow her immediately. Though Fen is clearly conflicted Margo says neither she nor Eliot will ever forgive Fen if she stops Margo from finding the one thing that might save Eliot. Both Fen and Margo shed a few tears as Margo is banished from Fillory and Fen ascends to the throne. Margo is branded and dragged away by the guards as she ‘curses’ Fen’s name (though she tells everyone to be nice to Fen and do as she says). Josh asks the guards for five minutes with Margo as she is escorted from the palace. Margo asks him to help Fen, and he gives her danishes, a new map, and a charged iPod with 80’s pop anthems. Margo vows to try and live, but tells Josh not to wait for her. He puts her headphones in her ears and Pat Benatar’s “We Belong Together” plays as she leaves on her quest to find The Foremost and save Eliot. A fully restored Harriet and Alice exit the lab to find Zelda, Dean Fogg, and Kady waiting. Zelda promises to lose the list of students rejected from Brakebills and Dean Fogg leaves. Now alone, Harriet tells Zelda that when she was trapped in the mirror world she could see everyone in the Library and discovered that Everett, the leader of the Governing Council, is behind the worm attacks on hedge witches. Pete is grabbed and infected with the worm. He wakes up in an alleyway with a slime-like substance in and around his ear. 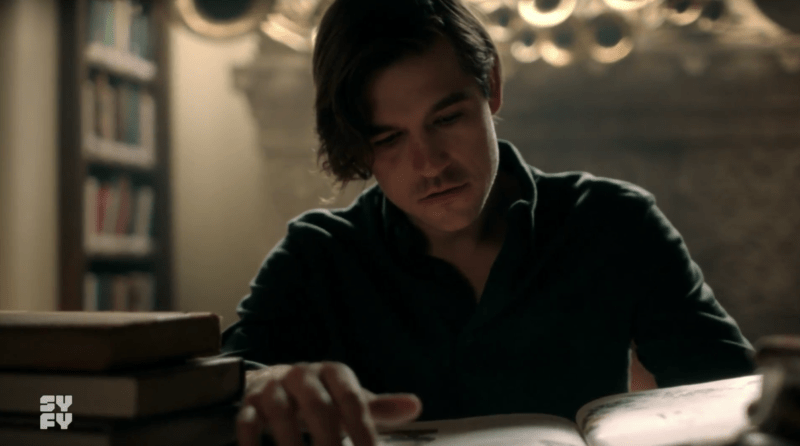 The Magicians airs Wednesdays at 9/8c on SYFY.